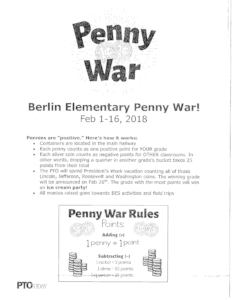 The Berlin Elementary School Penny War runs February 1-16, 2019. Containers are set up in the school lobby by grade. The grade with the most points “pennies” will be announced February 26hth. All money raised goes toward BES activities and field trips. See flyer for more details.